Believe it or not, salt is an incredibly important tool when you're trying to keep a ski mountain running during a warm spell. Unfortunately, the organizers of the Sochi Games did not believe this fact, and late last week, that oversight almost ruined the Olympics. The Games were saved by a heist of sorts. Four months after Sochi officials ignored the recommendation from snow (and, as it happens, salt) expert Hans Pieren to order 19 tons of salt for the Winter Olympics, a number of events were at risk of being cancelled due to poor snow conditions. These are the events that benefit from an icy surface rather than the wet, snowy conditions that have prevailed at Sochi. Salt's useful because it can melt the topmost layer of snow, which then freezes again to create a more useful surface. From there, a confidential international mission unspooled—a mountaintop "Ocean's Eleven"—that just may have prevented a major Olympic embarrassment. 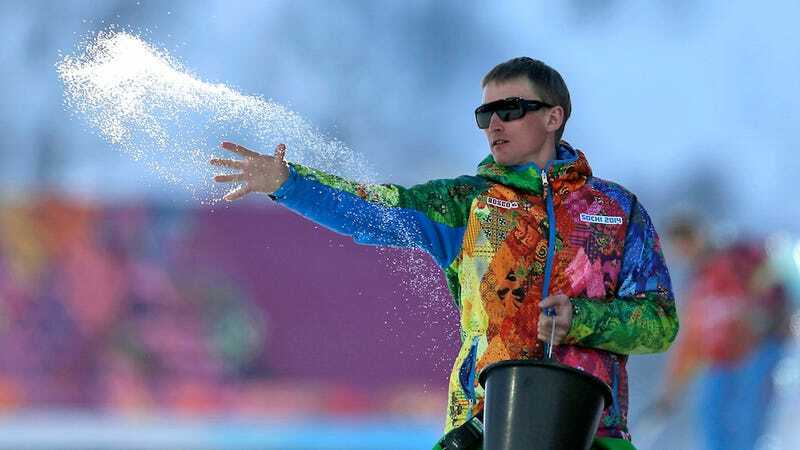 This Sochi salt accord involved a Swiss salt salesman working late into the night; a rerouted airplane that may or may not have come from Bulgaria; an Olympian turned salt savant; and Russians powerful enough to clear months of customs bureaucracy overnight. In the end, the organizers found a Swiss salt company that loaded an order of 24 tons of salt onto a plane that had rerouted from Bulgaria's capital (probably) to Sochi. Inconvenience aside, the salt shipment cost only $3,500, a drop in the bucket compared to the $50-plus billion already spent on the Games, the most expensive Olympics in history.